South West Water has recruited more than 100 apprentices, following the appointment of four more apprentices to its Exeter-based finance department. This brings the total hired so far to 102, which represents about seven per cent of the company’s current workforce. The milestone was marked today (6 March) at the start of National Apprenticeship Week, which celebrates the positive impact apprenticeships have on individuals, businesses and the economy. South West Water’s Managing Director Stephen Bird and Exeter College Principal John Laramy welcomed the new recruits to the company's Exeter headquarters. 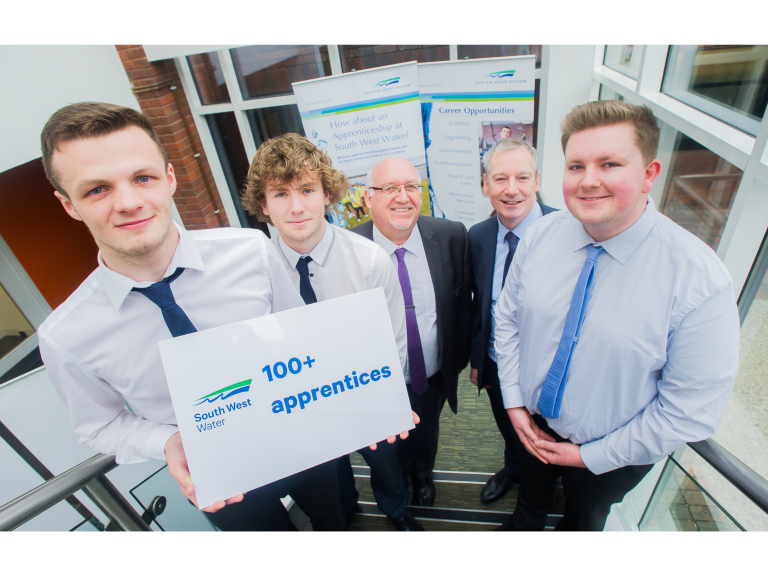 South West Water’s multi-award-winning apprenticeship programme, which started in 2011, goes from strength to strength as the company ensures it has a pipeline of new talent to replace experienced employees who are due to retire. The new finance recruitsare: James Perchard-Richards, 20, from Sidmouth; Daniel Stentiford, 20, fromExeter; Brianne White, 18, from Tiverton; and Ollie Donohue, 20, from Dawlish. During their two-year apprenticeships with Exeter College they will earn while they learn, spending time in each of the main finance areas, such as internal audit, corporate & central finance, capital finance, procurement, purchase ledger, operations finance and sales ledger. Nigel Fenn, Head of Organisational Development at South West Water, said: “We’re delighted to have recruited more than 100 apprentices. They’ve contributed significantly to our continuing success. In 2010 we identified a serious skills gap, with 40 per cent of our operational workforce due to retire within ten years. Apprenticeships were introduced as part of our workforce development plan to ensure that we continue to be fit for the future. South West Water is participating in several events during National Apprenticeship Week, including a National Careers Service roadshow and - on 9 March - Exeter Expo at Exeter College, the South Devon College Awards and the Education and Training Skills Awards.